For businesses to fully benefit from VR, placing people in the virtual world is only half of the equation. 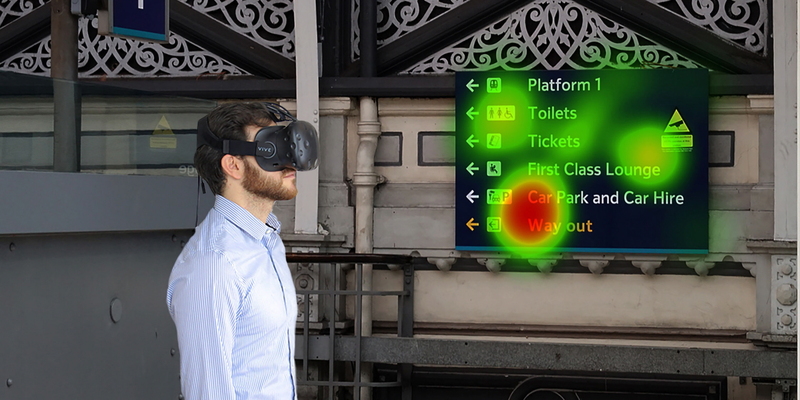 This blog post talks about how instant access to visualizations from eye tracking, interaction and navigation measurements collected from 3D VR environments can help you better train your staff, engage with your customers or optimize the design of your next project. On a supermarket shelf, the surrounding products determine how well a brand stands out as much as the pack design. The most eye-catching of billboards can fail to turn heads when the sun is behind it. A warning message on an operator’s dashboard can be completely missed if the worker is distracted by a phone call. 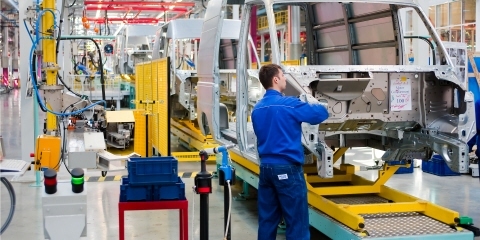 The dynamic changes in an environment that affect attention can present quite a challenge for anyone looking for insights on behaviour, regardless of whether they are interested in optimising the visibility of brand, improving informational signage in an airport or training quality assurance teams on how to check a vehicle coming off an assembly line. This is because dynamic changes are hard to control in the real world. It is incredibly difficult to establish the consequences of an environmental change without the ability to test it repeatedly with different participants. The best alternative is to collect data from enough people to allow the behaviours of interest to be visible regardless of the environmental noise. Large samples can be expensive and take a long time to collect and analyse, but to ignore the contextual effects is to risk the value of the research in the first place. For years, the only other viable solution has been to compromise on the realism of the research, for example by using screens of various sizes in combination with software or prepared stimuli that afford the control needed by researcher to establish causality for behaviour change. But such compromises mean that you are really changing the context again, and if there’s one thing we know from years of vision research, it’s that visual properties such as size, brightness, depth and viewing angle can significantly affect visual attention. For example, the findability of a product on a supermarket shelf will be different if it is displayed on 40” TV screen or a full-size projection. But the technology advancements that comes with VR changes everything. 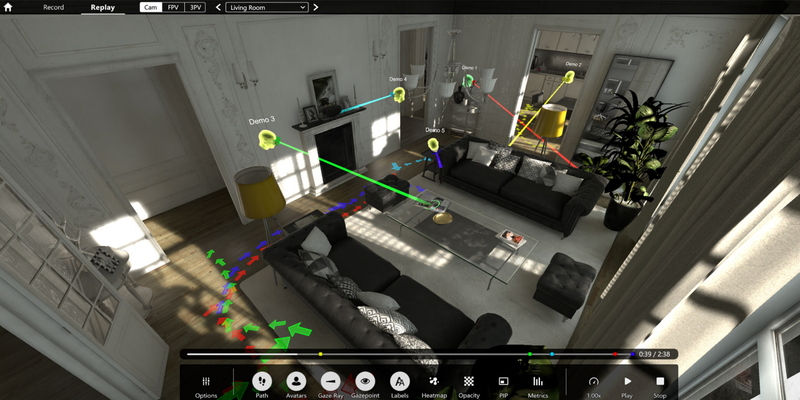 Now you can immerse a participant in highly realistic, 3D environments that you CAN control. 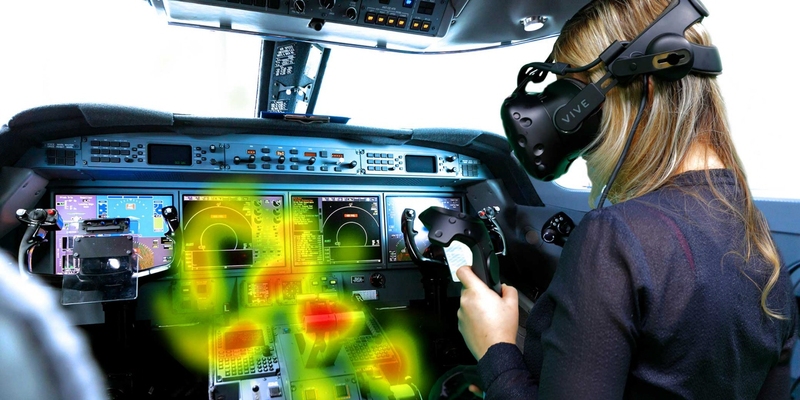 With complete control over the environment, eye tracking in VR not only makes it possible to measure attention, but also enables the optimisation of designs, interfaces and procedures that robustly maintain that attention for a range of environmental differences. Tobii Pro VR Analytics provides organizations with an easy to use to tool that embeds into Unity environments for collecting, analysing and visualising attention with the Tobii Pro VR Integration, a retrofitted HTC Vive headset featuring 120Hz Tobii eye-tracking. Analytics on attention, navigation and interactions are accessible with the push of a button. What does VR analytics add to my business? Package designs, planograms and point-of-sale messaging can now all be tested without the need for expensive full-scale projection screens. Additionally, fixtures can easily be embedded in a variety of contexts meaning packaging can be optimised to work in a range of retailers with different layouts and competing products. 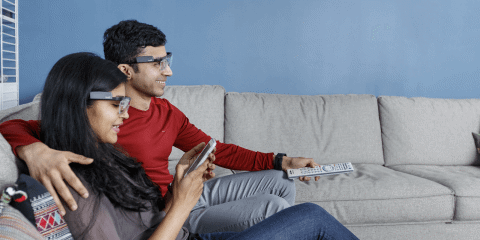 Automated eye-tracking analytics enable both the decision hierarchy and the design features to be evaluated ensuring that products not only capture attention, but hold it long enough to trigger a purchase. VR is increasingly being used to train employees, whether it be in customer service, quality assurance or technical troubleshooting because it enables repeatable scenarios without any safety risks for the trainee or say a patient when used by medical staff preparing for situations to be able to save lives. Eye-movement research has been used extensively to study the difference between novice and professionals and can now be used to provide direct feedback to trainees on how they attend to decision drivers, what they miss and on the visual strategies of experts in their field. Traditionally, good contextual testing of design has required physical prototypes to be created which is both costly and restrictive because it is not very supportive of collaborative or agile testing methods. Virtual Reality provides designers with a way to test early concepts in a meaningful environment without sacrificing the ability to test multiple concepts or variants of a design. With eye tracking, this means designs can be optimised to attract attention or for ease of comprehension, in the case of signage for example. These are just three examples. 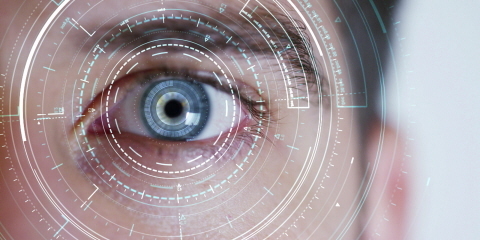 Whether for game design, educational applications, medical simulation or clinical interventions to treat phobias, the applications of research using eye tracking in VR are many and varied. How do I get started with eye tracking studies in VR? First of all, you will need a VR headset which is enabled for eye tracking like the Tobii Pro VR Integration. You will, of course, also need a VR ready PC which supports the headset, this is an important investment that will provide the best experience for participants, and the best insights for you. Secondly you will need an environment to test in. Right now this will need to be a Unity 3D environment. It doesn’t have to be an environment specifically built for immersive VR, so if you’ve already been using screen based virtual environments for research you should be able to reuse them here. There are a few extra considerations which will improve the results of your research which we will discuss in more detail in a future blog post – stay tuned! Finally you will need a tool to collect and analyze the data. Tobii Pro VR Analytics, is a Unity plugin, to be integrated into your environment. This means that the time and money you might have already invested into VR can be leveraged on. Integrating to Tobii Pro VR Analytics is quick and easy to do, and once it is integrated it comes with calibration of the eye tracker, live view and you are free to collect and analyze as many sessions as you like, always with results and visualisations immediately available after each recording. For more info about the Tobii Pro VR Integration, Tobii Pro VR Analytics, or for help getting started with running an eye tracking study in VR contact Tobii Pro. Alternatively, Tobii Pro Insight offers fully managed eye tracking research in VR and can run a study for you. Dr Tim Holmes is a visual neuroscientist and the Director of Research for Tobii Pro Insight UK. He has led eye tracking research with brands, designers and content producers for more than 8 years and played a key role in the design and development of Tobii Pro VR Analytics.